Dr. Olsson closed his practice of Psychiatry and Psychotherapy as of September 1, 2011. Therefore, Dr. Olsson is no longer accepting new patient referrals. Olsson will continue to post timely articles on this site and list new books he has completed and or published. By, Peter Olsson MD, Publisher, SBPRA, Houston. (2017). Available at Amazon et.al. Many psychotherapists suffer with soul-sadness and some with professional burn-out. 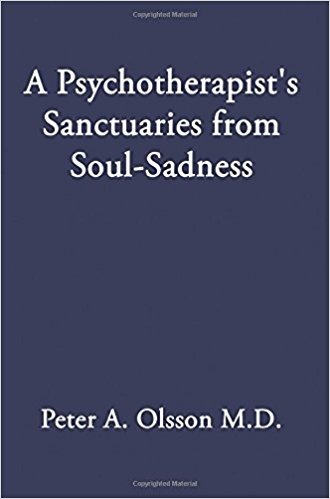 This book describes a method to prevent therapist burn-out and prevent or treat soul-sadness. Our patients share with us the joys, victories and, or, sorrows, pain, pettiness, betrayal, disappointments, cruelty, lies, and misery in their lives and relationships. We listen carefully and empathically. Between the lines of dialogue, however, we therapists hover along a continuum of self-protection. The extremes are between soul-sadness and a cool isolated detachment. Natural disasters, genocide, suicide bombings, hostage executions or beheadings, and sick and starving children leap to our attention on TV or print media. Our patients often mention these events, and we try to listen empathically to their feelings and fantasies about an often sad, cruel and frightening world. To be available to work objectively with our patients, we therapists often suppress or deny our own strongest feelings and fantasies about these events. Candid, authentic participation in peer supervision, individual supervision, and collegial support groups can be very helpful in dealing with soul-sadness. Our personal use of art, music, poetry, or writing also helps manage soul-sadness by discharging, soothing, containing, or sublimating these realities of our daily work life. I share instances where my creative writing served me well as an outlet or sanctuary from the soul-sadness in my life and work. I offer and discuss my creative writing in reaction to (1) External world and national events, (2) Clinical work with patients and my professional activities, (3) My personal losses and grief, (4) The last dream in my personal analysis. (5) the death of my psychoanalyst. And (6), a collection of my poems. psychodynamic patterns in the lives of those who become "homegrown terrorists"
and commit acts of cold-blooded murder or acts of terror. 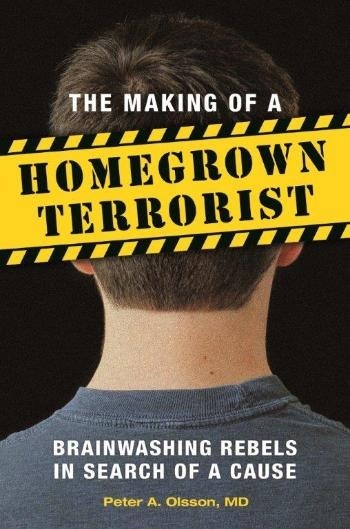 Olsson examines twenty detailed case histories of individuals—often youths or young adults—to provide theoretical and practical understanding of homegrown terrorists.The book focuses on individuals that include Timothy McVeigh; Ted Kaczynski, a.k.a. "The Unabomber"; the "Shoe-Bomber" Colleen LaRose, a.k.a. "Jihad Jane"; Nidal Malik Hasan, an American-born physician psychiatrist and former U.S. Army officer who opened fire on American troops at Fort Hood, Killeen, TX, killing 13 and injuring more than 30; and Dzhokhar and Tamerlan Tzarnaev, the two brothers charged with placing pressure cooker bombs at the finish line area of the 2013 Boston Marathon. 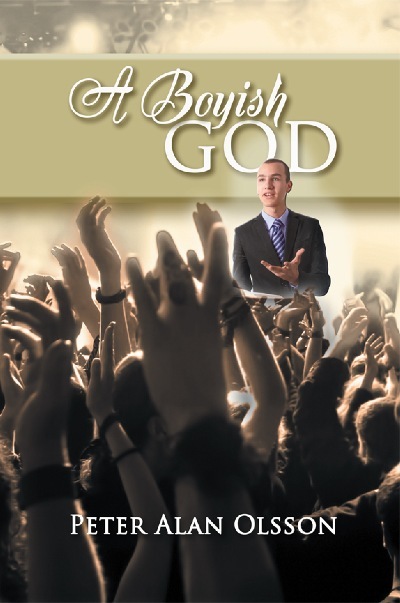 It also delves into topics such as distinguishing between "good charisma" in a youth versus "evil charisma" and recognizing the characteristics of a healthy group or leader versus those with unhealthy motivations. Indoctrination techniques by Al Qaeda recruiters and the subtle processes found in so called self-radicalization via the internet are discussed in detail. Such subject matter will be of interest and importance to anyone, from concerned citizens and parents to teachers and terrorism specialists. Psychotherapists help police find two homegrown terrorists in the crime thriller .When two bombs explode at St. John’s High School in Houston, psychotherapists Tom and Andrea Tolman assist their friend, Houston Police Detective Mark Lane, in the intense investigation. They need to find the terrorists before they can strike again!Andrea is a former nun who left her order to marry Tom, a psychiatrist and psychoanalyst with expertise in treating adolescents, and in understanding destructive religious cults and terrorist groups.After 9/11, the couple and the detective became friends when they helped a family threatened by the father’s involvement with a Satanic cult. Now, ten years later, they are challenged by these local bombers.The story explains the depth of psychology as well as the powerful motivations of the American homegrown terrorists and their group. This fascinating yet terrifying book probes into the psyche of a schoolboy who deeply needs therapy. On the playground of Saint Thomas Moore School in Houston, Sister Agnes hears young Will Powers’ fiery funeral sermon for a dead bird. At the insistence of his teachers, Will reluctantly stops his explosive eulogy. Will’s parents have apparently turned their back on their son and won’t return the school’s calls. The school psychologist turns for help to a trusted psychiatrist friend, who is able to delve into Will’s perspective and what is driving him. But can this troubled boy be helped? The novel is disturbing, but deeply necessary. Perhaps the Rev. Jim Jones at one time was also considered A Boyish God. bookorder@sbpra.net Peter Alan Olsson Proudly powered by WordPress. "Understanding the past in emotional depth, can provide freedom from its grasp in the future." Click on the link above to check the History Channel web-site for the current show times. 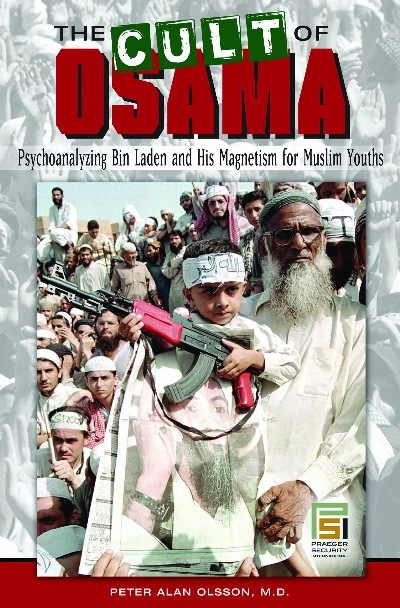 CULT OF OSAMA: Psychoanalyzing Bin Laden and His Magnetism for Muslim Youth. 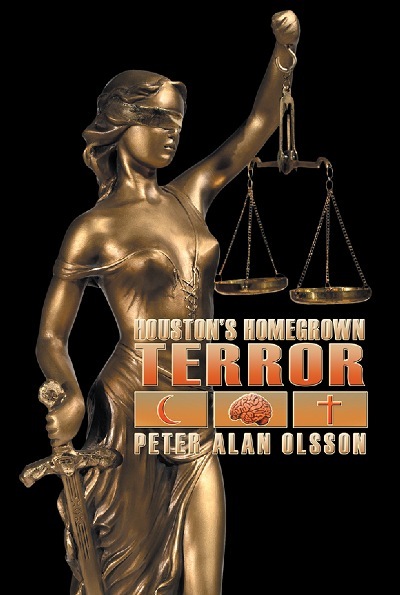 In CULT OF OSAMA, Dr. Peter Olsson approaches Osama bin Laden et. al. from an applied psychoanalytic and psychodynamic perspective. He applies psychological and social psychological observations from his 25-year study of destructive cults and cult leaders to try to understand the mind of Osama bin Laden. There are many journalistic, political, military and intelligence books about bin Laden and Al Qaeda. 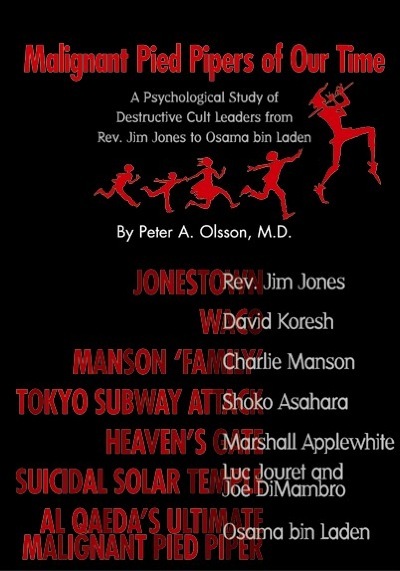 But, Olsson’s study offers a purely psychological, psychobiographical, and social psychological perspective on Osama. 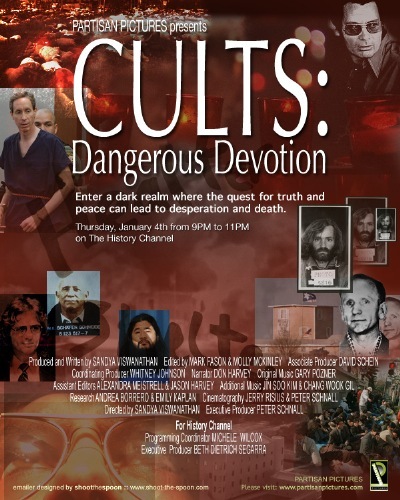 Dr. Olsson is a psychiatrist and psychoanalyst and the author of Malignant Pied Pipers of Our Time, a 2005 study of destructive cults and cult leaders. Osama’s psychobiography resonates with the psychological wounds and narcissistic injuries that reverberate among many Arab and Muslim youths in their search for meaning, identity, and heroes. Osama and AL QAEDA's Malignant Pied Piper appeal stems from this peculiar but profoundly important synchrony of shared trauma and pain between Osama/AlQaeda and Arab/Muslim youths. By Peter A. Olsson, M.D. The timeliness of the topic is evident on the front page of the daily newspaper, which explodes with descriptions of the latest terrorist victims, cult suicides, or bombings by religious fanatics. Throughout the world, people are starving for information on ways they can protect themselves, their children, and their friends from falling prey to extremists. "Poems Behind a Psychiatrists Couch"
Dr. Olsson's book of poems is available thru amazon.com.